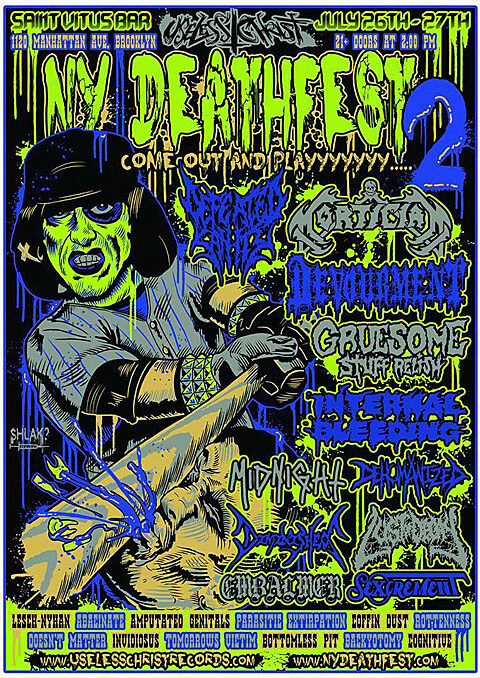 The second annual New York Deathfest, put on by Useless Christ Records, happens at Brooklyn’s Saint Vitus on July 26 & 27. The lineup for the two-day event looks a lot different from what was announced in February, adding genre heavyweights aplenty. Tickets for both days are still available. So, what can you expect? Death metal. A whole lot of death metal, plus a little grindy and thrashy variety. As mentioned, day one (July 26) features Dallas slammers Devourment. Known for their speedy snare hits and stupidly big grooves, Devourment will certainly snap some headbanging necks. They released Conceived in Sewage in 2013 via Relapse. Joining them will be NYDM institution Mortician. Will Rahmer and Roger J. Beaujard’s ultra-simplistic chug is love it or hate it, but it’s hard to deny their truncated tales of blood and horror are pure death metal. Word is the drum-machine-assisted duo (though they find a human for live shows) are working on their first album in a decade. For some flavor, blackened speed metallers Midnight will be making an appearance. The Ohioan filth-merchants are releasing No Mercy for Mayhem, their second full-length, August 19 on Hells Headbangers. Rounding out the day are Mexico’s Rottenness, the ultra-br00ful Lust of Decay, and the cosmic Plague Widow, among others. Check out the full day’s festivities below. Day two (July 27) collects some of the genre’s biggest riffers, including Germany’s techy Defeated Sanity. The now-20-year-old group cut the razor-sharp Passages into Deformity in 2013 for Willowtip, and are set to pinch-squee their way into the hearts of those who love technical nimbleness and massive chugs. Also making the trip from Europe are Giallo grinders Gruesome Stuff Relish, who unite an OSDM buzz with the gore-soaked mashing of Impetigo. Long Island brutal death metallers Internal Bleeding — who will be hitting the road with Suffocation and friends later on in the year — are also set to shake the stage with slams. 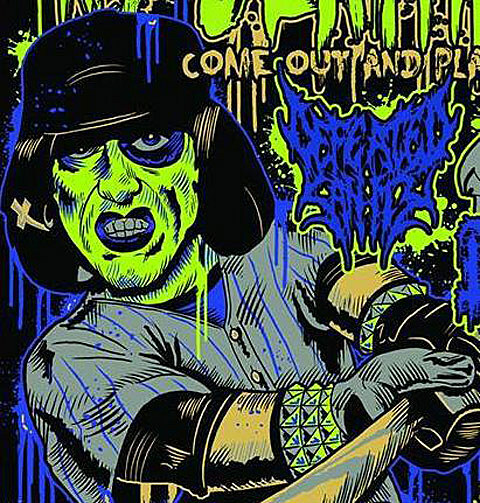 Cleveland’s Embalmer, Floral Park’s Dehumanized, and possible fest-stealers Coffin Dust are also dropping in. Again, the full lineup appears below.